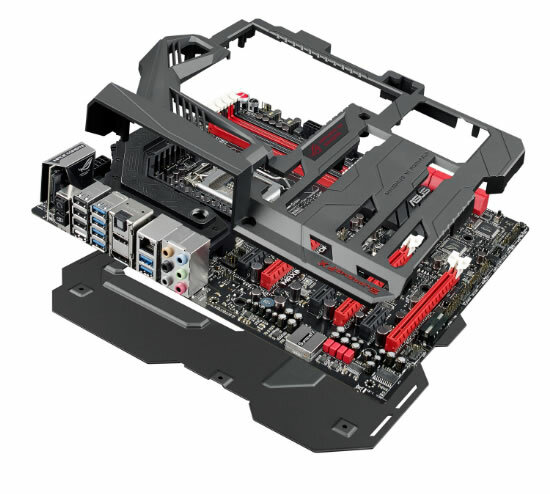 Asus Republic of Gamers today announced the Maximus VI Formula motherboard at Computex 2013. The ROG Maximus VI Formula is the ultimate gaming motherboard, with a stylish ROG Armor cover and a SECC (Steel, Electro-galvanized, Cold-rolled, Coil) backplate with thermal pads for added strength and cooling. Maximus VI Formula features the CrossChill hybrid thermal design, which offers the option of both air and liquid cooling. Integrated ‘Pin-finned’ heatsinks improve heat dissipation with an increased surface area, while twin G1/4-inch threaded sockets support any standard liquid cooling loop. ROG testing has shown that a liquid-cooled Maximus VI Formula motherboard with CrossChill operates at temperatures up to 23 degrees Celsius lower than air-only cooling. Overclocking performance is also enhanced by Extreme Engine Digi+ III power delivery, featuring 60A BlackWing chokes, 90% efficiency NexFET MOSFETs and 10K Black Metallic capacitors. A bundled mPCIe Combo II card also provides 802.11ac Wi-Fi and Bluetooth 4.0 wireless, plus an M.2 interface for ultra-compact NGFF (Next Generation Form-Factor) SSDs. Maximus VI Formula raises the bar yet again with SupremeFX onboard audio. This features 120dB SNR headphone output with a 600ohm headphone amplifier, and renowned WIMA and ELNA audio capacitors. Differential signal processing with OpAMP and EMI shielding reduce electromagnetic interference, too.